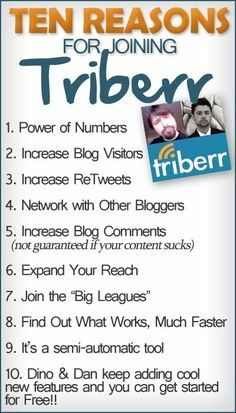 Triberr.com is a social media platform for bloggers that will drive tons of traffic toward your website’s blog. Over the years, Triberr has grown and evolved. It has become a powerful traffic tool. I personally use Triberr and now have a reach of over 530K on Twitter. I highly recommend using Triberr. Triberr.com, created by two enterprising young men, Dan Cristo and Dino Dogan, assists bloggers in reaching their greatest audience from one site. Triberr is a community full of all types of bloggers, who blog on a multitude of subjects, and carry all levels of experience. These bloggers seek out like kind and join together in groups, known as tribes. Most tribes have a common interest or community, meaning that everyone in the tribe blogs about similar topics. For example, the tribes of which I belong generally blog about books, reading, writing, and publishing. You can join tribes, or start your own tribe and invite others to join you – it’s all up to you! Each tribe member tweets (in addition, they can now post to Facebook and LinkedIn if they choose to do so) other members’ blog posts easily by sliding their cursor over a share button to send the link out to all of their own followers. The tweet is then scheduled to go out using a frequency that can be changed under the settings tab. Triberr is a place to make new friends, find other bloggers within your community, network with bloggers of all levels and styles, and help others by spreading the word about them, while they, in turn, help spread the word about you. What Triberr really is, is a community. A meeting place of like-minded bloggers. A place to gain support, advice, and establish both friendships and relationships, while expanding your footprint on the Internet as well as increasing your role as a blogger. Promoting your blog can become as easy as publishing it, allowing Triberr to pick it up from your feed, having your fabulous Tribemates read it and sharing. In return, you do the same for them. Easy! Recently, I had a problem with my feed for this blog and was going a little nuts over it. Dan and Dino were quick to respond to a simple tweet with a link to my Bonfire post. Bonfire is the forum used by Tribemates to air problems, seek answers, and find new tribes. Thanks to Dan, my feed was back up and running properly in mere cyber-minutes. Now that’s support you can count on, and knowing I have backup like that builds high confidence that my posts will continue to be seen and shared. My Tribemates are awesome, friendly, caring, and share crazy – I can’t thank them enough for all that they do to help me promote both this blog and my review blog, Unwrapping Romance. I highly recommend joining Triberr.com, getting involved, and broadening your reach while meeting extraordinary people. So check out Triberr and TRIBE UP! If you’d like to learn more about how Triberr works, how easy it is to sign up and get started, check out A GUIDE TO GETTING STARTED ON TRIBERR. Also, it’s FREE to join! So what are you waiting for? I apologize for not being around for the next installment of how to use social networking to promote yourself and your book but life has a tendency to throw us some curves occasionally that fill our time, our thoughts, and our obligations. That’s what has happened to me recently and it’s taking some time to bounce back from, but I’m here now. I’m ready to help you negotiate your way through Facebook and its challenges to use it wisely and efficiently for promotion. Facebook is a social network that every author, blogger, or other businessperson needs to learn to use, and use well. You might think to yourself, well, it’s just a matter of making a page for myself and posting endlessly about my book. That is exactly what you don’t want to do. If you have a personal page on Facebook or plan to create a personal page, keep it that way. Feel free to add author friends, reader friends, and blogger friends to your life through your personal page but create a page specifically for your author life, blogger life, or business life. You can do this easily once you have a personal page, simply go to account settings under your log-on on your personal page and click on Create Page. Once there you can create your own page where folks can follow YOU by liking your page. On your PAGE, you can post about your book, your events, and spread the news about your plans for the future, without filling your friends’ feeds with all of it. If you wish to share onto your personal page, it’s an easy thing to do – just switch back to your personal page, click-through to your PAGE, and share your post. Simple connect – no log-out and logging back in – simply switch from your personal timeline to your PAGE. Have fun, personalize your page like you would your personal timeline. Host events, play games, and feel free to post whatever strikes your fancy. It’s your PAGE, and that makes it your world. Let your friends know that you’ve got a PAGE now, interact with followers, and just have a good time. Throw a welcoming party to spread the news and watch the new likes start accumulating. Follow other authors, bloggers, and comment on their PAGES just as you would on your friends posts from your personal timeline. It’s a fun, easy way to let readers know you’re there – enjoy it! So if you use Facebook already for promotion, how has it benefited you or hasn’t it? By the way, how many of you are doing NaNoWriMo this month? I did it last year and succeeded – what a great feeling to meet a goal you set and to even do it faster than you thought. If you’re participating, feel free to let me know and although I’m not participating this year, I’m playing cheerleader for all who are! WRITE ON!